Considering the long, winding lines at Boston’s first Food Truck Festival last August, you would think that Chris Masci, founder of the South End’s SoWa Open Market, which hosted the event, would be busy planning a sequel. Those crowds formed hours before most of the mobile eateries had opened, and the queues at some peaked at around 250 people. Every last morsel was eaten. But instead of ironing out the details of a second annual event, Masci says he sees “no need to have another festival.’’ Over the past few months, he says, food trucks have become fixtures around the city. Two years ago, just mentioning “Boston’’ and “food truck scene’’ in the same sentence would have been laughable; thick reams of red tape prevented entrepreneurs from setting up shop within the city limits. Then an initiative led by Mayor Thomas M. Menino, coupled with a measure passed by the City Council earlier this year, made it significantly easier for vendors to clear the regulatory hurdles. 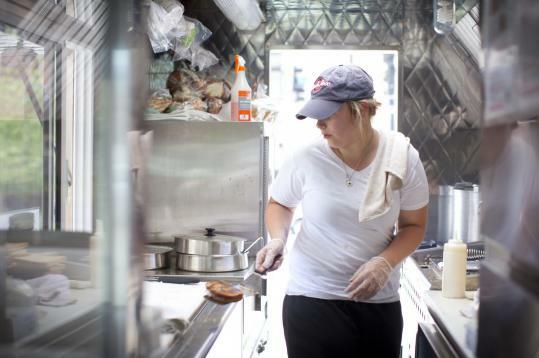 As a result, Boston is poised to become one of the nation’s newest food truck capitals. In fact, it may already deserve that designation: Since around this time last year, about 30 mobile eateries have been operating in Boston and Cambridge. And Boston will add 12 to 20 new vendors by next spring. Add it all up, and it’s hard not to agree with Masci. There really is no need to plan a festival because, in a way, it’s already happening. Instead of lasting for just a few hours one summer day, Boston’s food truck celebration is ongoing and everywhere. And here to stay. NOTE: Many of these trucks can be found at various locations around town. Here are places they are most likely to be. Check websites and Twitter feeds for up-to-date information. LOCATIONS City Hall Plaza, Mon-Fri; SoWa Open Market, Sun. It’s no wonder this bright yellow truck, serving sunny, Vietnamese-inspired fare, has quickly become a crowd favorite after winning a city-sponsored competition voted on by the public last year. Bon Me’s banh mi sandwiches rival those in Vietnamese enclaves, and its lighter rice bowls and noodle salads are great washed down with a herbaceous and sweet Thai-basil limeade. Tea-cured deviled eggs are a yummy, Asian-inspired take on a classic. LOCATIONS Kendall Square and City Hall Plaza, weekdays. Don’t let the long lines at Momogoose trucks intimidate you. During one recent lunch, it only took three minutes to get through a 15-person line. This light Asian fare is better than much other Asian fast food, but some dishes fall short. Chicken pho is laced with the right amount of star anise, but the noodles are limp and the chicken is tough. The popular gu nuong, Vietnamese grilled lemongrass chicken, is delightful, if a little salty. LOCATIONS Greenway across from Rings Fountain, Mon-Sat; SoWa Open Market, some Sundays. Looking for a souped-up grilled cheese sandwich? Grilled Cheese Nation has several worthy candidates, including the Blue Man Goo, a mix of blue cheese, peach chutney, and balsamic vinegar on raisin pecan bread. But why mess with a classic? The truck’s simple Boston Common, gooey cheddar on thick slices of pain de mie, pairs perfectly with the chunky, herby tomato soup. LOCATIONS Greenway at Dewey Park, weekdays; SoWa, some Sundays. Take just one bite of these crazy vegetarian sandwiches and you will be hooked. The heavenly Granny-B-Good, slices of tart green apple and gooey cheddar, wedged in grilled sourdough, is paired with a side of Taza chocolate. The 40 Thieves is a study in contrasts: tangy goat cheese, sour and crunchy slaw, cool fresh mint leaves, and the Middle Eastern herb mix za’atar, all piled on a veggie burger. Lefty’s is one of the only places in the city serving Stumptown coffee, an addition every Beantown java addict should applaud. LOCATIONS Greenway at Rowes Wharf Plaza, Tue-Thu; Kendall Square, Tue-Thu; Concord Avenue, Belmont, Mon-Sat; Auburndale, Newton, Mon-Thu; SoWa Open Market, Sun. This mobile yurt’s most popular item is its pulled pork sandwich, which is fine, if unmemorable. Instead try the Uzbek lamb skewers, juicy morsels of meat grilled directly over coals on a Turkish-style barbecue, then sprinkled with sea salt and rosemary. If you are looking for a meal that will tingle your mouth and stick to your ribs, the spicy jerk chicken stew over rice should do the trick. LOCATIONS Kendall Square, Mon-Fri; Greenway at Dewey Square, Mon-Fri; City Hall Plaza, Mon-Fri; SoWa Open Market, Sun; Longwood Medical Area, coming soon. You can smell a Clover food truck before you see one, thanks to the heavy dose of rosemary sprinkled on fresh-cut fries. The chickpea fritter sandwich always seems to sell out first, but egg and eggplant pita is the best offering. For early risers, a warm, buttery popover makes a worthy companion to brewed-to-order coffee. When it opens on the Greenway later this summer, the DosaMobile will make a colorful addition to the neighborhood, taking foods like dosas and samosas out of Indian restaurants and putting them back where they belong: on the street. The truck will be the mobile version of Central Square’s Dosa Factory, which churns out tasty, if a bit oily, dosas, or mammoth Indian pancakes filled with various savory fillings like curried potatoes and onions. LOCATIONS Park Street T Stop, weekdays; SoWa, some Sundays. Some think a pickle is just a pickle, but Grillo’s elevates this lowly garnish into a work of art. Spears are crisp, tangy, and infused with heavy doses of dill and garlic. Sample their takes on carrot sticks and green tomatoes, which transform otherwise bland vegetables into addictive snacks. Those addicted to the tart frozen yogurt made popular by chains Pinkberry and Red Mango will love the FroYo Truck’s nonfat California tart soft serve, especially paired with fresh berries. The Oreo offering is a winner, too: creamy enough to be decadent, but light enough for a hot summer day. LOCATIONS Loring-Greenough House in Jamaica Plain, nights vary (announced on Twitter); SoWa, some Sundays. Many food lovers today want to eat like chefs. Here is their chance, created “by a restaurant’s staff, for a restaurant’s staff.’’ Chorizo sandwich with sardo cheese, chimichurri sauce, and marinated red peppers is a great weekday lunch, even better as a 2 a.m. weekend snack. Don’t miss Staff Meal’s homemade pork rinds, a gourmet take on the convenience store mainstay. LOCATIONS Loring-Greenough House in Jamaica Plain; Coolidge Corner, St. Paul Street, Brookline Village in Brookline; SoWa Open Market, some Sundays (schedule announced on Twitter). How many food trends can you fit into one place? At least four, if this (1) food truck serving, (2) cupcakes made from, (3) locally sourced, and (4) organic ingredients is any indication. (There are vegan options, too!) The Sam Adams chocolate cupcake and salted caramel cupcake, which features an improbably salty jolt of thick buttercream frosting, top the offerings. Will Gilson, chef at Garden at the Cellar in Cambridge, and business partner Aaron Cohen have been staging pop-up restaurants in interesting locations, like the British Consulate in Kendall Square, for six months. A food truck is the obvious next step. While Eat Wagon has no permanent site yet, it has rolled up to some special events featuring burgers, hot dogs, and tacos. Those worried about swimsuit season should skip Fillbelly’s. Everyone else? Get in line. Crisp fried chicken and fluffy coconut waffles make a coma-inducing entree, but the mac ’n soul casserole — classic mac and cheese stuffed with shredded cinnamon sweet potatoes and collard greens — seals the deal. You’ll want seconds, but don’t. Finding the empty lot that Big Moe’s calls its semipermanent home can be a challenge — and well worth it. Fatty brisket chopped, slathered with spicy sauce, and piled on a soft bun is one of the best barbecue bites in town. The barbecue chicken matches perfectly crisp skin with juicy, tender meat. Ribs are fine, but not falling off the bone. For sides, the potato and onions are a must. See some of the trucks revving up locals and find out where they usually park. Discuss Your favorite food truck?